My skills at the hula hoop have always been nil. I would watch in envy as friends, obviously more flexible than me, orbited the hoop around their midriff for what seemed like hours. Looking back, my hooping moves likened more those of the “Elaine Dance” (of Seinfield fame) than Annette Funicello — or Frankie Avalon for that matter. The hula hoop has recently resurfaced in my life, however, this time as a far more useful tool: a skiing aid for my three-year-old. How so, you ask? We simply utilize it as a way to keep our son, who yet possesses the physical ability to form his “pizza wedge” fully and hence, effectively control his own speed, within our reach by placing it over his head. He holds onto it in the front while we ski behind him, holding onto the other end. Voila. He’s the ‘king of the world’ as we cruise down the hill, while mom and dad have peace of mind. There are two other advantages to using this high-tech tool. (1) It also acts as a barrier, I feel — a force field of sort — around my son, protecting him from others speeding by, and (2) when you need to tow the little one (up a hill or along a flat), you can simply flip it over his or her head and pull your budding skier along. Now, I must give credit where credit is due: I got this idea from the ski instructors at Crystal Mountain in Michigan who have been at this ‘teaching kids to ski thing’ far longer than me. Bravo. This is a great idea! Our youngest just graduated to skiing on his own, but a hoop would have helped us avoid a father/son crash (luckily nothing got hurt — except an ego). 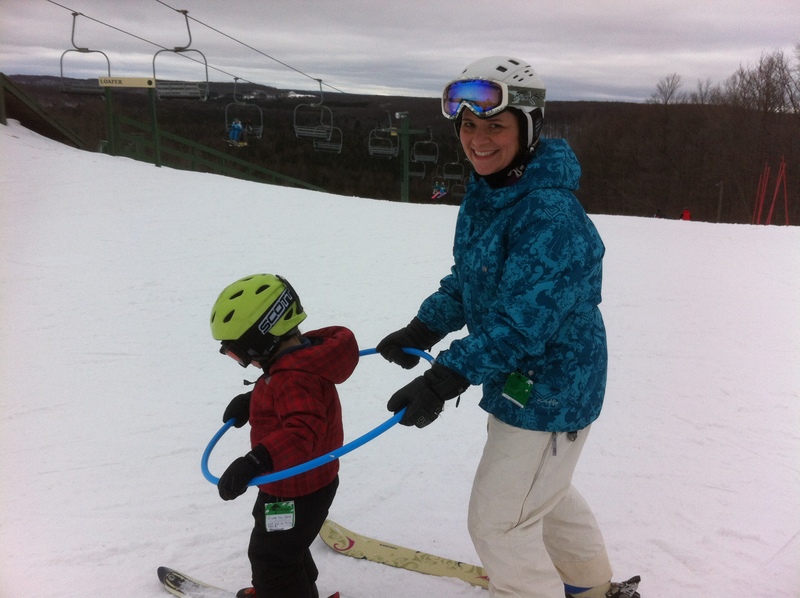 This entry was posted on February 1, 2012 by mittenkidz in Winter Fun and tagged Crystal Mountain, learning to ski, Michigan, Skiing, skiing in Michigan, teaching kids to ski, tips for teaching kids to ski.